Javier Marias often writes sentences that are full paragraphs, and while some require me to read them several times over for clarity, others make me reach for my pen to record them in a journal I keep for exquisite quotes. This is, perhaps, a strange thing to say to one’s new bride. But it gives an indication of the depth of secrets contained within Juan’s story. From the very beginning, when Teresa who would have been his aunt had she not shot herself in the breast before Juan was born, there is a sort of veil which covers everything. “Why did she kill herself?” we ask ourselves, filled with apprehension as we read to the end of the book. “Why are there so many secrets the couples keep from one another?” For each of the couples in this novel have a relationship within which something is hidden. Perhaps equally tragic was the relationship of Juan’s friend, who desperately seeks love through a dating service. Each person sends a letter, and often an accompanying video of himself, to the person with whom a potential match is made. But, the man responding to Berta’s letter will only be satisfied with a video showing all of her personal parts; he makes it quite clear that he will sleep with her only if she is attractive. How tragic to me that she responded to his request, so great was her need for relationship. Threats and empty promises, wounding one another through lies and deceit, these are how Marias’ couples seem to interact. The lines from Shakespeare’s Macbeth appear throughout the novel, for it is from one particular phrase that it takes its name. Yet, can one partner cover another’s guilt? Conversely, does one’s guilt shade another’s heart so white? This is the struggle which Juan faces as he uncovers his personal history involving a father who has been married three times, and not one wife is still alive. 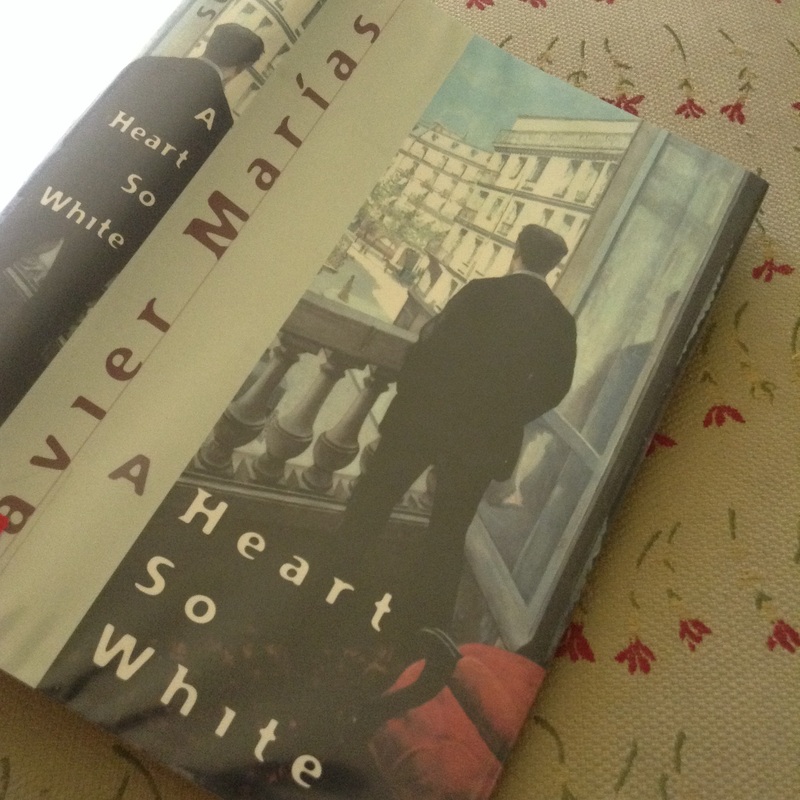 A Heart So White won the Dublin IMPAC prize for the best novel published worldwide in English in 1997. Find other thoughts from JacquiWine’s Journal, A Little Blog of Books, and Tony’s Reading List. Other friends who read it this month are Frances from Nonsuch Book and Scott from seraillon. Lovely review. This is such a mesmerizing novel. I read it a few years ago now but it has stayed with me. I really must read more Marias before too long. It is indeed a mesmerizing novel. It’s taken me all week to read it, and it only clocks in at around 250 pages, but I guess I was keeping track of every nuance that I could. And, he so intricately weaves his plot no thread is left undone. I read The Infatuations for the IFFP two years ago, and loved it; this was quite good, too, although I think I preferred The Infatuations of the two. Thanks for the link, Bellezza. I love your review – that’s such a great quote! I read another Marias (All Souls) for Spanish Lit Month and it struck me just how much of his writing circles around the same themes, particularly the keeping of secrets and their revelation. It’s very cleverly constructed, isn’t it? In some ways, I didn’t want the story to end but the closing chapters tie everything together so beautifully. Jacqui, I found it hard to write about. A book so complex, so beautifully intricate and thoughtful, each sentence so laden with meaning, is not easy for me to convey. I can’t believe it took me a week to read these 278 pages, when I read A Clash of Kings of 780+ in four days. But, I couldn’t rush Marias in his storytelling. I couldn’t risk missing a thing. I’m not sure I would have read this without you writing about it first, so thanks for the impetus. And, while I liked it, I think The Infatuations is my favorite. Thanks for sharing my post – I read this a couple of years ago now and must read more of Marias’ work. I think The Infatuations would probably appeal to me the most. I read The Infatuations, my introduction to Javier Marias, when it was on the long list for the Indepenent Foreign Fiction Prize two years ago. Much to the shadow jury’s disappointment, the novel never progressed beyond that. But, I was grateful to have learned about this Spanish author, and read his masterful writing of which A Hear So White also contains. I, too, find this novel “intricate and thoughtful,” Bellezza, and yet I, too, agree that this isn’t my favorite Marías (I like two or three others more, in fact). For a massive but very short change of pace, you might want to consider checking out Marías’ novella Bad Nature, or With Elvis in Mexico to see how deft this often lyrical prose stylist is at an adventure/comedy hybrid–a real surprise! Richard, I always value your suggestions. Even when the novel doesn’t become a favorite, it expands my knowledge beautifully. With Elvis In Mexico sounds hilarious (and, for some reason that title puts me in mind of The Savage Detectives). I will look in our abysmal library for the titles you recommended, and as always, I thank you for leaving your thoughts here. Nicely done, Bellezza – I held off on reading this until I’d finished the book and thought about my own post. It’s certainly a difficult work from which to choose quotations, as it scurries into so many different corners of human relationship and the myriad qualities of language and silence. I like the thematic motif that language itself seems made of both truth and deceit, and the clever way Marías uses the “treason” of translation and interpretation to explore that theme. Well-chosen quotes! From such a vast array of things to feature, to focus upon too. I gave up on notes after a while as the time it would take to capture them might eventually exceed the reading time. I like the idea of shared guilt that you touch upon here, and wonder about the many ways that characters in the novel can find themselves with the blood of their husband’s weaponry on their hands so to speak. One of many things to explore in this one. I can see the wisdom in giving up on taking notes…there is much to contemplate in this novel, which though fairly slim is packed with threads to follow. That’s been the great thing about reading your review and Scott’s, each of you have picked up something particular to focus on which is better than trying to give an overview as I have done. Many things to explore, indeed.